After a whirlwind of First and Second Round games, March Madness moves on with 16 teams left advancing to the next series of play. Most NCAA tournaments include a few major upsets -- that is, lower-seeded teams defeating higher-seeded squads in bracket-busting victories. This year, a select number of March Madness' first weekend match-ups fell nothing short of stunning. No. 7 seed South Carolina defeated No. 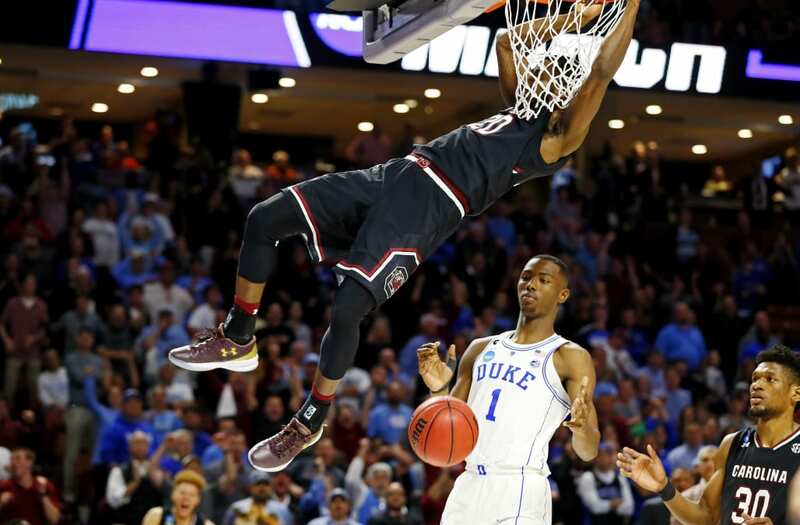 2 seed Duke in a stunning 88-81 upset victory on Sunday night. A tournament favorite to win the championship by many expert standards, this was the greatest upset of the tournament thus far. The South Carolina Gamecocks scored 65 points in the second half alone against the Blue Devils, after shooting 7-for-35 in the first 20 minutes of play. SEC Player of the Year Sindarius Thornwell led the Gamecocks in scoring with 24 points. The game was also played in Greenville, South Carolina after the NCAA pulled tournament play out of North Carolina in protest of the state's anti-transgender HB2 bathroom bill. The semi-home play advantage may have contributed to the Gamecocks victory. South Carolina faces Baylor on Friday. The defending NCAA champion Villanova squad suffered a 65-62 loss against the Wisconsin Badgers last Saturday, when they became the first No. 1 seed to exit the 2017 tournament. Villanova had a chance to tie after Wisconsin's Vitto Brown missed a free throw, but the attempt fell short. Wisconsin faces Florida on Friday. No. 11 seed Xavier enters the Sweet Sixteen with the worst odds out of any other team, but has proven their worth on the court so far with upset victories over both No. 6 seed Maryland and No. 3 seed Florida State. The Xavier Musketeers defeated Maryland 76-65 in the First Round, and went on to trample the Florida State Seminoles 91-66. Xavier's Trevon Bluiett put up 29 points against FSU, while Kaiser Gates came off the bench to put up a respective 14 points. Xavier faces Arizona on Thursday. The No. 12 seeded Middle Tennessee defeated No. 5 seed Minnesota in the First Round last week, in a 81-72 victory. Although Middle Tennessee was technically the lower-seeded team, the Blue Raiders were actually the Vegas favorite by 1.5 points. While Vegas did not consider this an upset, they were -- nevertheless -- the lower-seeded team. Middle Tennessee was eliminated in the Second Round by Butler. In their first NCAA tournament appearance since 1999, No. 11 seed Rhode Island defeated No. 6 seed Creighton 84-72 in the First Round last week. Rhode Island outscored Creighton 11-4 in the first seven minutes as both teams struggled to get into offensive rhythm. The Rams went up 15-8 on a jumper by Iverson before the Bluejays came back to tie the game on a 3-pointer by Cole Huff. URI was defeated by Oregon in the Second Round.